A wagon ride along the Main Road of Sherbrooke Village is a unique way to see this tourist attraction in Nova Scotia, Canada. Beautifully groomed horses pull a wagon full of people through the Sherbrooke Village Museum in Nova Scotia, Canada. 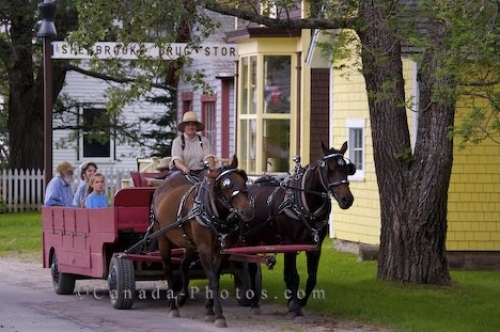 As they pass by the Sherbrooke drug store which dates back to the 1880's, people can either exit the wagon or continue the ride through the rest of the village. Horses pulling a wagon travelling along the Main Road, Wharf Road, in the Sherbrooke Village Museum (a restored 1860's lumbering and shipbuilding community) in the town of Sherbrooke along the Marine Drive, Highway 7, Nova Scotia, Canada. Picture of people enjoying a wagon ride along the Main road in the Sherbrooke Village Museum in Nova Scotia, Canada.